Any self-respecting fashionista will know that an outfit on a bright sunny day just isn’t complete without a pair of shades to keep you cool. Yes ok and the obvious reason – to stop you squinting like Mr Magoo! The one-size-fits-all rule however, does not apply to these mischievous black-capped (or Bolivian) squirrel monkeys at London Zoo. And it hasn’t stopped them pilfering other people’s shades either. Despite their innocent looking-faces, this quick-fingered South American gang has taken quite a shine to designer sunnies and has notched up an impressive collection. 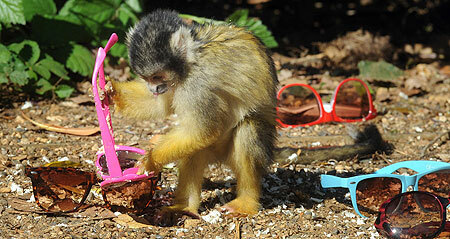 The monkeys’ growing stash has meant that staff at the zoo have had to think fast how to quash this mini crime wave. The solution has been to coat a selection of sunglasses with a bitter apple substance in the hope that the monkeys start to associate the unpleasant taste with all specs and put them off from stealing them. Keeper Kate Sander said: “The little ones are very inquisitive, they are attracted to the shiny lenses on the sunglasses. The enclosure has been built to house a breeding group of black-capped squirrel monkeys in a habitat aimed at recreating the Bolivian rainforests as closely as possible in the centre of London. When I visited the enclosure last year, I was surprised to see just how open the walk-through is. There are no boundaries between the visitors and the primates, who happily scurry across ropes suspended inches above your head. 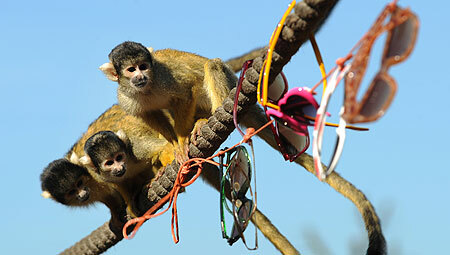 The squirrel monkeys are New World monkeys of the genus Saimiri. They are the only genus in the subfamily Saimirinae. According to experts, their brain mass to body mass ratio is 1:17, which remarkably gives them the largest brain, proportionately, of all the primates. All that brain power seems to be channelled into causing mischief. Four years ago the gang underwent another rehabilitation programme after stealing mobile phones. Maybe next year they’ll have figured out how to sell these stolen goods on….with a mark-up! ← Oil exploration suspended in DRC, but for how long? What is this thing with sunglasses – the chimps at the sanctuary in Cameroon that I volunteered for in March also loved to steal them. And you stood exactly zilch chance of getting them back. All the volunteers knew that the chimps had a penchant for grabbing ‘face furniture’, but it’s very easy to underestimate the length and speed of those hairy arms! Let’s face it unless it’s nailed down or part of your clothing primates will have a go at swiping anything. My camera trip-pod (a fairly hefty piece of kit)was picked up and snapped in two like a twig last year by a juvenile chimp; not only was a stunned at her speed but her strength and she wasn’t even fully grown!! Number one rule in TV never work with children or animals. According to ZSL the reflection of the sun off the lenses make them ‘shiny’, which makes them more attractive to these monkeys. I bet there have been some tears with the loss of many a pair of Ray-bans!